The exposure of heavy metals (lead (Pb), cadmium (Cd), copper (Cu), nickel (Ni), and metalloid arsenicals) and their effects on workers’ health from a lead-zinc mine (145 workers) and a steel smelting plant (162 workers) was investigated. Information on subject characteristics was obtained through a questionnaire. We determined the urinary levels of Pb, Cd, Cu, Ni, and arsenicals (including inorganic arsenic (iAs), monomethylarsonic acid (MMA), and dimethylarsinic acid (DMA), as were 8-hydroxydeoxyguanosine (8-OHdG) and cystatin C. Lead-zinc mine foundry workers had significantly higher concentrations of urinary Pb, Cd, Cu, Ni, iAs, and MMA than did steel smelting plant workers. Individuals who had consumed seafood in the previous 3 days had higher concentrations of urinary Ni than did individuals who had not consumed seafood. The urinary Cd concentrations in the two groups of factory workers may have been affected by daily smoking. There was no significant difference in urinary 8-OHdG between workers from the lead-zinc mine foundry and the steel smelting plant. Urinary Pb and Cd had significant positive linear dose-dependent effects on 8-OHdG. Urinary cystatin C, a sensitive biological indicator reflecting early renal damage, was found at higher levels in lead-zinc mine workers than in steel smelting plant workers. 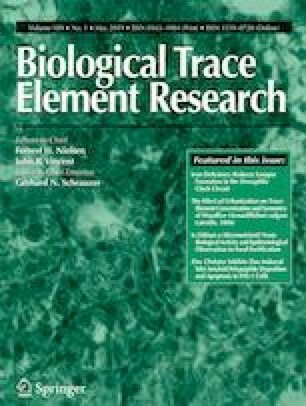 Binary logistic regression analysis showed that age and urinary Cd were significantly associated with urinary cystatin C. These results indicated that workers from lead-zinc mines may be exposed to higher levels of heavy metals which could lead to greater risk of kidney damage. This work was supported by the National Natural Science Foundation of China (NSFC) (81673207). We thank International Science Editing (http://www.internationalscienceediting.com) for editing this manuscript.